Today, we are discussing step 2: Create an atmosphere conducive to improvisation. 2. Create an atmosphere conducive to improvisation. For some students, improvisation will be easy and fun. For others, it may seem intimidating. Creating an atmosphere conducive to improvisation will help reassure students and encourage them to be creative, especially if they are only accustomed to reproducing what is on the page. No such thing as “wrong notes” — Be sure that the student understands that because they are the improviser,anything they play is correct! Getting over the fear of playing wrong notes will allow them to more easily focus on expressing themselves through their music. Share musical authority — The student should be encouraged to express themselves and create whatever sounds that are pleasing to his/her ears, instead of trying to figure out what they think the teacher might want to hear. The teacher should praise whatever efforts they hear and never be critical of the student’s improvisation. Even when improvisation is done together with the teacher or in group of students, musical authority should be shared. Set parameters — Improvisation, no matter what kind, always has some parameters. Example parameters include: key, mode (major or minor), meter, tempo, black keys only or all keys, one or both hands, or a time limit. A teacher may give a number of parameters, for example: “Let’s improvise a slow piece together on the black keys. Let’s use only quarter notes and half notes. You can play in the upper register with just your RH, and I’ll play along with you in the lower register.” Parameters serve as guidelines to give the student direction as to how to improvise for that session. Creating a conducive atmosphere is essential to successful improvisation. Coming up next: Part 5c of Incorporating Improvisation into the piano lesson. 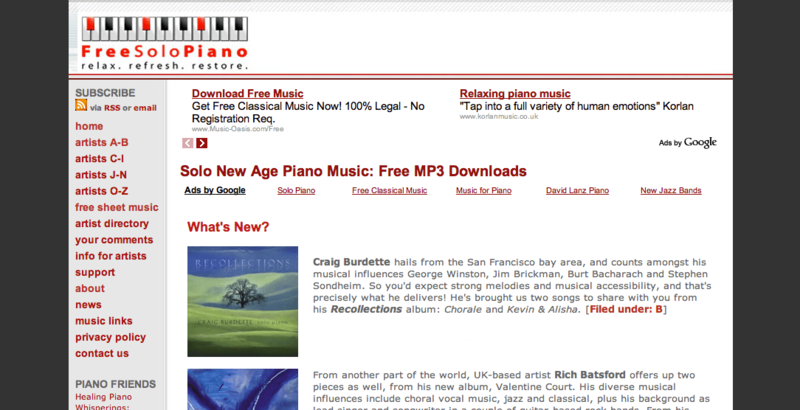 I recently came across an interesting site containing free mp3s of new age solo piano music. What a great resource to pass on to my piano students! It’s important for students to listen to a wide variety of music, but often they are only exposed to pop music. New age piano music is bound to tickle the fancy of most students — especially since it’s free. To download onto your computer so you can listen or upload to your mp3 player, right-click on the blue arrow beside the track you wish to download and select “Download linked file.” Then open the file in iTunes (or whatever media player you use). Enjoy! 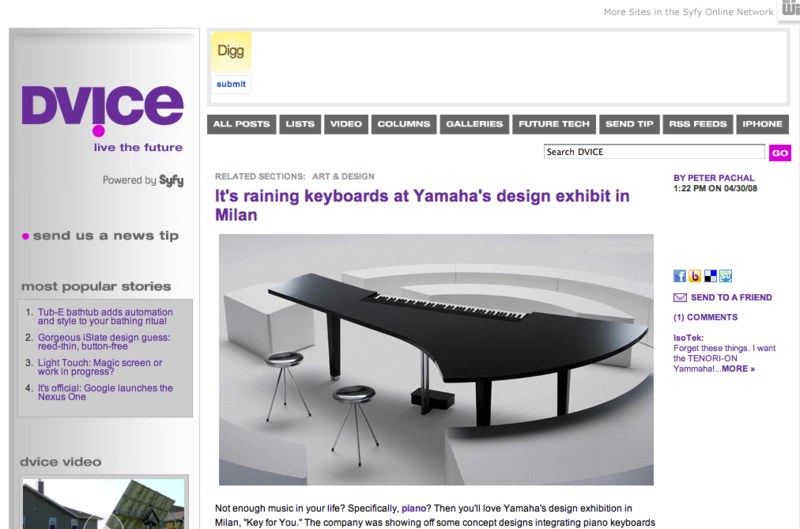 Check out these pictures at dvice.com, featuring modern keyboard designs by Yamaha! I particularly like the one shown in the screenshot at right. Would I ever buy a keyboard such as this? No, probably not. If I had the money to spend, I’d buy an acoustic piano, not a keyboard. Acoustic pianos are still far superior to keyboards, even considering the great improvements that have been made to keyboards over the years. They just don’t compare, in my book. Now to the heart of the discussion! We’ve already covered some common obstacles encountered when trying to incorporate improvisation, and we’ve briefly discussed the history and the value of improvisation. Now let’s discuss a practical way to incorporate improvisation (non-jazz improvisation, in particular) into the piano lesson. There are 4 steps in the method I am proposing for incorporating improvisation. I had originally planned to post all 4 steps into one post, but the post would be too lengthy. Today, we are discussing step 1: Developing Related Skills. Playing by ear — will help the student learn how to play what they hear in their mind’s ear, which is essential to improvisation. For a list of melodies to assign students to practice playing by ear, see the Melodies to Play By Ear and Harmonize pdf, available on the Printables > Other Resources page (scroll down to the M’s). Harmonization — will help increase the student’s understanding and awareness of harmonic progressions. Even young beginners can harmonize, using just a single-note bass line of the tonic and dominant pitches. For a list of melodies to assign students to practice harmonizing, see the Melodies to Play By Ear and Harmonize pdf, as mentioned above. Transposition — will help students understand how keys and key signatures work, so they can improvise within a particular key, and in a number of different keys. Also helps them understand the difference between major and minor, which they can utilize to create different moods in their improvisations. 5-finger patterns, scales, arpeggios, cadence patterns, chords in all inversions, etc. (in all major and minor key signatures) — These are exercises that teachers should already be assigning their students, but I think it’s important to bring them up here in connection with improvisation. If the student still struggles with getting around the piano, improvisation will likely be difficult. The more comfortable the student is with playing various configurations of notes on the piano, the easier it will be for the student to “get beyond the notes” and focus on things like expression, mood, and telling a story with their music. Each of the skills mentioned above can be taught gradually to the student, in accordance with their level of playing. For example, beginner students should be assigned simple tunes to play by ear that can be played entirely on the black keys, and gradually work up to tunes that can be played on the white keys. Coming up next: part 5b of Incorporating Improvisation into the piano lesson. Improvisation fosters creativity and individuality. Improvisation appeals to both the performer and the audience. Strengthens the connection between theory and practice in the developing musician. I just discovered some fun resources at the Piano Technicians Guild website – check them out! One highlight is an activity for students to cut out and put together a 3D-ish piano out of paper. It’s pretty realistic! The FJH Music Company website is introducing a new method series, available March 2010: Helen Marlais’ Succeeding at the Piano. I have heard some good things about the method, and am looking forward to trying it with a student once it comes out! Click here to view the page about it and to pre-register for a complimentary copy of the Lesson & Technique book. Early and Renaissance Music: Improvisation has its roots in early music traditions, before the invention of musical notation — when music was shared and passed on to the next generation by rote. Remember that improvisation paper for school that I’m been mentioning here and there? Well, I’ve been accepted to present my research findings at the poster session on January 22 as part of the 2009 Michigan Music Conference in Grand Rapids, Michigan! I don’t know if any of you Michiganders out there are planning on attending the conference, but if you are, please drop by during the meet-the-author session at 10:30 and say hello!